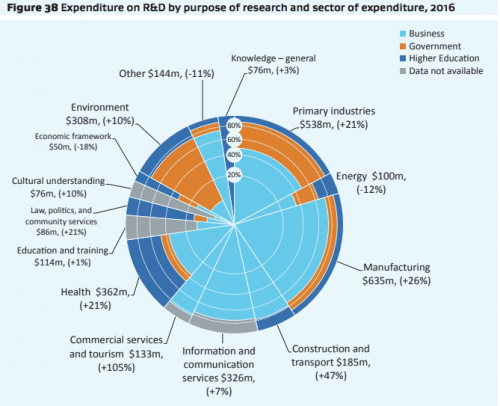 The latest New Zealand's R&D performance report shows that investment in innovation continues to be weighted towards the manufacturing and primary sectors, that business expenditure on R&D is low (but growing), the number graduates in STEM subjects is also low, and that the ratio of male to female researchers in the mathematics, physics and engineering and ICT is at best three to one. The 108-page Research, Science and Innovation System Performance Report is the second in what is intended to be a regular series that began in 2016. 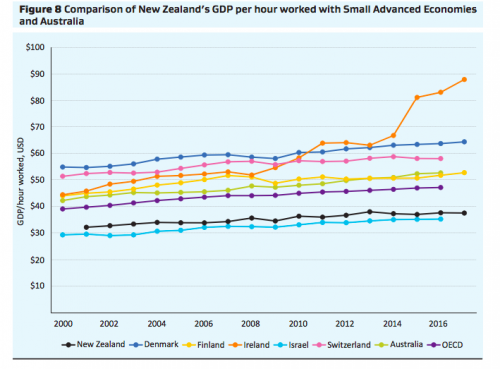 It provides a number of interesting graphs that show where the R&D spend is occurring and benchmarks New Zealand's progress against small advanced economies, OECD and Australia. While the focus of R&D spend is changing slowly, the graph below shows that Manufacturing and Primary Industry are still the largest sectors to benefit (the percentages in brackets show changes in value since 2014). 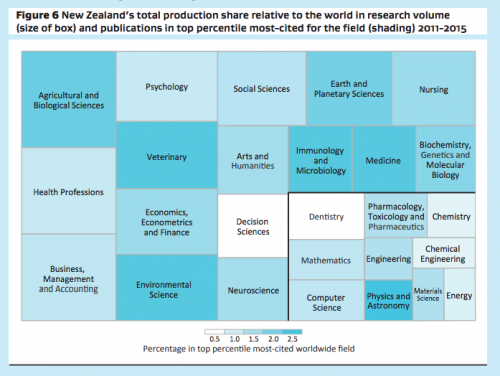 This is also reflected in the composition of research papers that are produced, with the least amount in areas such as computer science, mathematics and engineering. 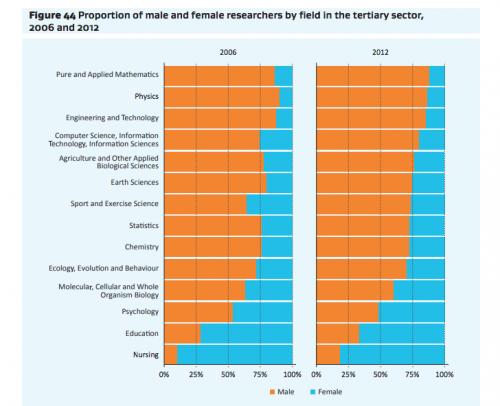 Meanwhile the proportion of male to female researchers to shows that the former continues to dominate in areas such as mathematics, physics and engineering & technology. 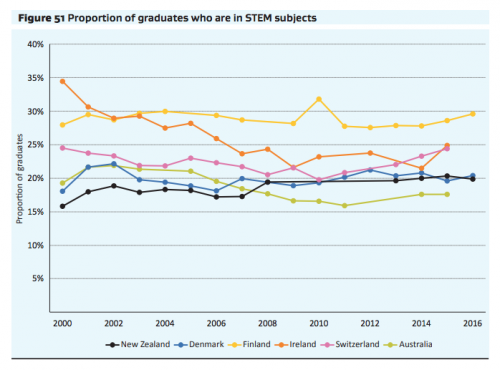 Only 20% of New Zealand graduates studied STEM (Science, Technology, Engineering, Mathematics) subjects, and when comparing New Zealand's performance against other similar countries, we appear to be running in the mid to low-end of the pack. When it comes to business expenditure on R&D (BERD), New Zealand is at the bottom when compared to other small advanced economies, with just 0.63% spent on BERD as a percentage of GDP. As a result, the proportion of New Zealand firms reporting innovation is 49%, compared to top ranking Switzerland at 75%. BERD is increasing, however, with the report noting that BERD increased by $356m (29%) between 2014 -2016. The report notes however that New Zealand's economic productivity "continues to lag its peers." "According to the OECD and the Treasury, low R&D investment and innovation rates appear to be important factors behind New Zealand's low economic productivity. Strong business R&D investment coupled with a developing start-up ecosystem suggests system-change in this area. Increased business R&D was driven by higher average investment per firm in computer services and manufacturing." Future growth may lie partly in the start-up community, and the report notes that start-up investment has quadrupled over ten years - from $21 million in 2006 to $87 million in 2016. It quotes the Start-Up Genome Ecosystem Report, which claims start-up activity here is gaining in momentum but currently lags behind similar countries and is characterised as being in the "activation phase".